Meet the King Family. Fox Searchlight has just unveiled a fantastic new website for their upcoming film The Descendants, directed by Alexander Payne, starring George Clooney as a father of two daughters living on Hawaii caring for a wife who's in a coma. The website was unveiled today (via THR) and is actually a virtual/literal "family tree" for Matt King (Clooney's character) and his relatives, both those very old, and his brothers/cousins still alive, to his kids and other people related to the family all over Hawaii. You can navigate around the tree and click each profile for a video on them - very cool. Great way to explore the film. I highly suggest clicking the image below to visit the website: king-family-tree.com. Although it's still in Flash and not HTML5, it's a cool site and a great way to explore the depth of the characters in this. Enjoy! The Descendants is both written and directed by Oscar winning American filmmaker Alexander Payne, director of Election, About Schmidt and Sideways previously, plus a screenwriter for Jurassic Park III and I Now Pronounce You Chuck & Larry. The screenplay was actually co-written by Payne and Nat Faxon & Jim Rash, from Kaui Hart Hemmings' novel of the same name. 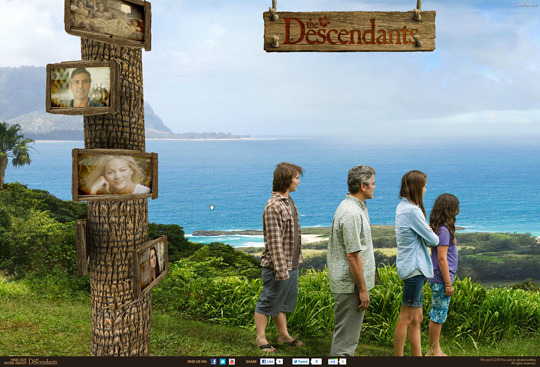 Fox Searchlight will be bringing bringing The Descendants to limited theaters starting November 18th. You can watch the trailer here or visit the site.